I feel accomplished but disappointed at the same time… It looks like I got progressively worse! 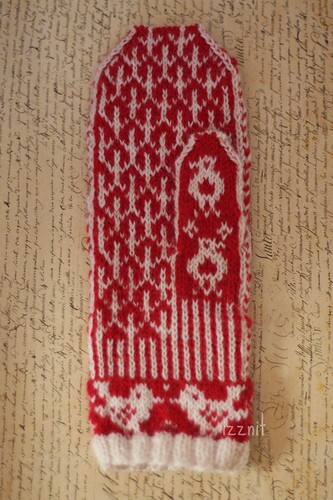 You can tell by just looking at the red stitches inside the bird wings–the ones in the birds near the cuff are significantly smaller than the ones in the mitt. The difference from the third bird to the fourth is major too. The backside is much neater than the front and has no lumpiness at all, even at the top, so I have no idea what happened. I tried readjusting the tension on some stitches but it just wants to go back to it’s lumpy state. My floats at the back are loose and there’s a lot of stretch…Bleh. At first I thought it was a tension issue overall, but I only have issues with the front. Now for yarn dominance. The strand that’s under is likely to be more dominant, so I made the white one the strand that went under, but it looks like my red is more dominant? Do I have something backwards? The tragicness is too overwhelming for me to handle. 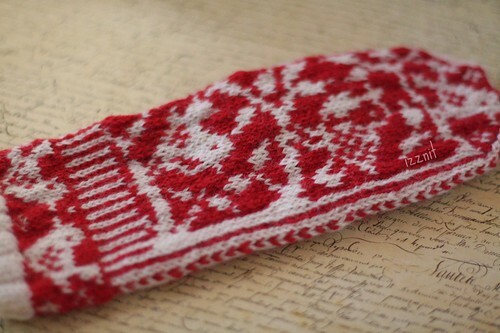 The second mitt’s going to have to wait! It’s easier to maintain even tension of short repetitive areas like the back than it is to do it with more random areas of color. Have you blocked it stretched over some sort of form? I have to do that with my stranded colorwork to get it to look decent. 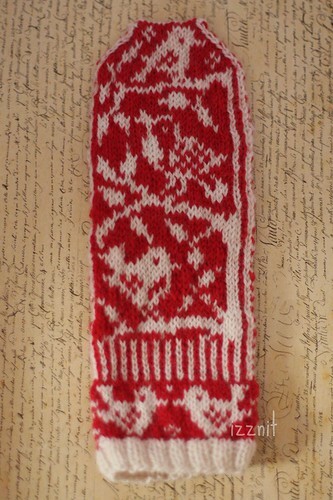 I still think the mitten looks cute! Sorry it didn’t turn out to please you, but you heard the expression “practice makes perfect”. I think it looks awesome!